During the fall most shops will check your car's anti-freeze when you have it serviced and will advise you to top it up with additional anti-freeze or will do it as part of the process. But if you have a bit of a leak in the coolant system you might have added a little water without thinking and along comes a really cold day. Friday afternoon this car was over heating and the drivered headed over to a mechanic to sort out the problem just as I came along (Picture above) they had opened the hood and a heater hose or radiator hose reached its limit and there was scampering. The steam had built up an enormous force and a person can really get burned if you try to open a radiator cap of a vehicle with a problem like this one brewing. 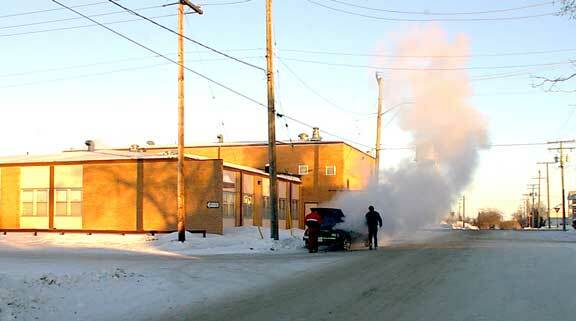 The engine heats up the coolant which has froze in the radiator and your vehicle is in really deep trouble. If you get an indication of overheating on a really cold day. 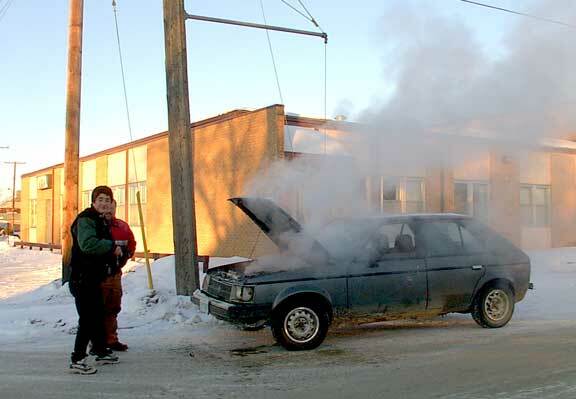 Park the car and let it cool down, don't even think about opening that hood. You need service work done and that is pretty well that. You might be able to restart it once it cools down and drive a short ways thus avoiding a tow but don't stick your head over that engine.